Apple’s new iPhone 7 is more expensive to make, than the iPhone 6s. According to a teardown by IHS Markit Limited, the new iPhone costs more to manufacture because of its bigger battery, more storage capacity and other factors. IHS found that the total cost of manufacturing the IPhone 7 is $224.80 (approx. Rs. 15,000), including $5 for basic manufacturing costs. This is about $36.89 (approx. Rs. 2,472) more than the iPhone 6S, IHS said. Without including the basic manufacturing cost, the 32GB iPhone 7 costs $219.80 (approx. Rs. 14,700) to make. The selling price for this particular iPhone is $649 (approx. Rs. 43,000) in the US, while it is slated to sell at Rs. 60,000 in India. Of course, the final selling price of the iPhone is further subject to margins, advertising costs, etc., over the cost to make. Considering all of this, it is actually surprising that Apple hasn't jacked up the prices of the iPhone this year. The new iPhone 7 and iPhone 7 Plus were unveiled on September 7, alongside the new Apple Watch. Apple dropped the headphone jack from the device, creating space for a dual-camera module on the bigger model, while also adding a new taptic engine and a bigger battery. The Bill of Materials (BOM) cost for the iPhone 7, according to IHS, is similar to flagship smartphones made by Samsung. However, Apple’s margins are better than the South Korean giant. Apple has already seen good demand for its new iPhones, despite the lack of a headphone jack. 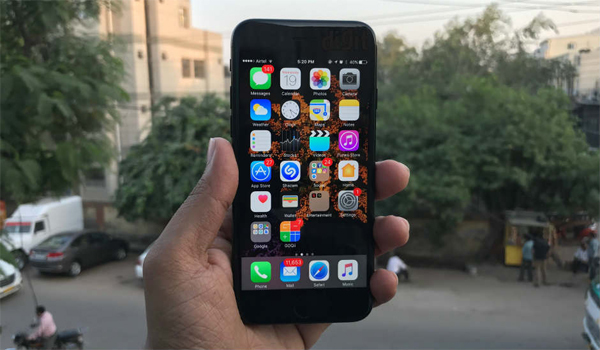 The company said last week that units of the bigger IPhone 7 Plus have already been sold out in all colours, while the iPhone 7 is sold out in the new jet black colour. That said, reports have said that interest in the new iPhone have been subdued in some markets. This is because of new and cheaper brands like OnePlus, Xiaomi and others, who sell flagship-class Android phones at much lower prices than what Apple, Samsung, Huawei and some others ask for.